Twitter has been a sort of online arena for scandals and controversial posts that spark outrage or a loud discussion. There probably isn’t a single day before the heat is on about something. When it comes to Jennifer Lawrence, it is known that she speaks her own mind every time. However, this particular controversy was initiated by another user who spoke about her after a photo was posted where the young Academy Award winner posed alongside her co-stars from the Red Sparrow movie in London. Except for Jennifer Lawrence, the photo featured Jeremy Irons, Matthias Schoenaerts, Joel Edgerton and the film director Francis Lawrence. 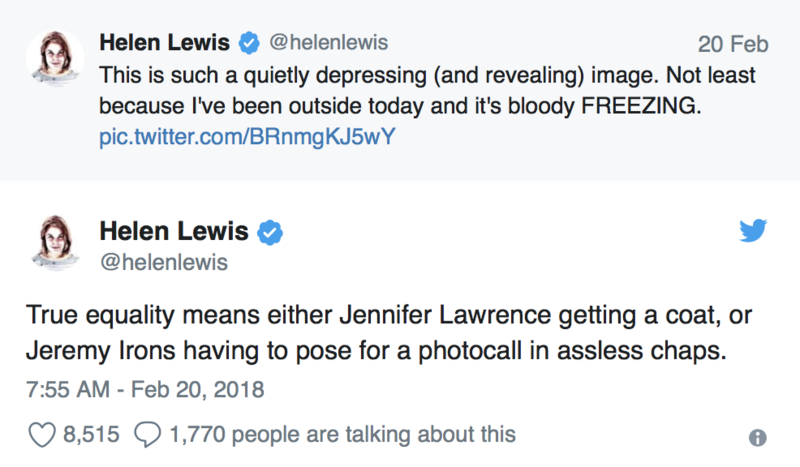 One of New Statesman’s editors – Helen Lewis – captioned the photo, because apparently she did not like the fact that Lawrence was in that photo wearing a Versace tight dress in the cold and nothing on top, while the men surrounding her were fully dressed for the cold with jackets and coats. Lewis was kind of furious, actually. Helen Lewis captioned the photo after posting it on Twitter, saying that the depressing image actually said it all. 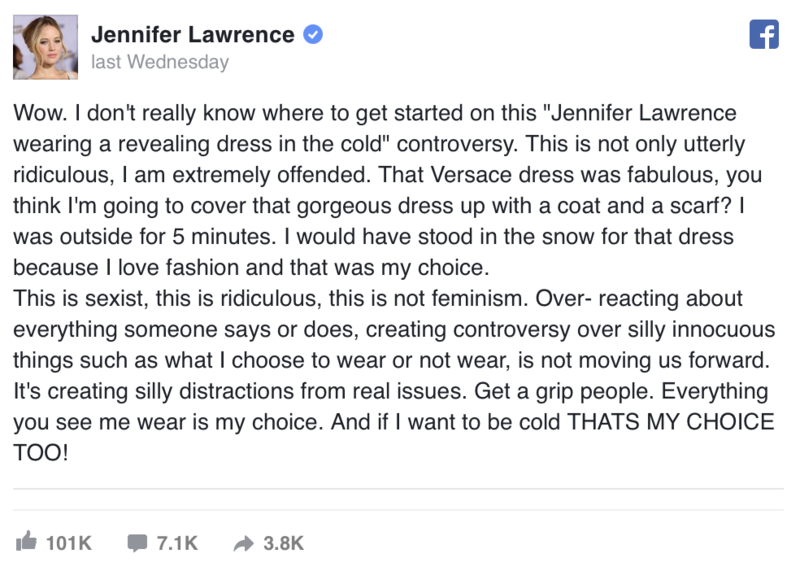 She added that she knew exactly how freezing it was and continued to express her opinion in a second tweet, in which she wrote that if there was real equity between men and women, Jennifer Lawrence should have been with a jacket on her shoulders, or at least Jeremy Irons had to wear some pretty torn up pants, especially from the behind. 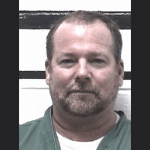 Some users immediately agreed with Lewis’ position, but others said that she did not report the full story, and someone even posted a pic of Lawrence arriving earlier in a coat, which she apparently just took off for the photo. The more reasonable users said that it was all a matter of choice and the actress simply wanted to appear the way she did, and there was no real sign or even a hint of inequality in that photo. The debate became so fierce that Lawrence herself decided to join in, but chose to say what she had to say via Facebook. The actress stated that she was blown away by the ridiculous controversy that was initiated by something trivial. She stated that she was outraged by all of this and added that she chose that gorgeous Versace black dress and she had no intention of covering it with a jacket for the photos, and there was no need for one, either, because she spent less than five minutes outside. Lawrence added that such interpretation of the situation was very sexist and a reaction like Lewis’ had nothing to do with feminism. The young actress concluded her post by saying that her choice of clothes is only up to her, and she stayed in the cold dressed like that, it was also a choice she made herself.